The story of humanity's prehistoric expansion across the planet is recorded in our genes. And, apparently, the story of the spread of language is hidden in the sounds of our words. That's the finding of a new study, which concludes that both people and languages spread out from an African homeland by a similar process—and that language may have been the cultural innovation that fueled our ancestors' momentous migrations. Tracing the spread of languages has been difficult. Most linguists use changes in words or grammatical structures to try to track language evolution. The English word "brother," for example, translates as bhrater in Sanskrit, brathir in Old Irish, frater in Latin, and phrater in Greek. These differences can be used to reconstruct the ancient words that gave rise to these modern ones. But unlike genes, these cultural units cannot be traced back far enough to distinguish patterns of language change much earlier than about 6500 years ago. So Quentin Atkinson, a psychologist at the University of Auckland in New Zealand who has long worked on language evolution, decided to look at language units whose pedigrees might be traceable further back: phonemes, the smallest units of sound that allow us to distinguish one word from another. For example, the English words "rip" and "lip" differ by a single phoneme, one corresponding to the letter "r" and the other to the letter "l."
Atkinson looked at the phonemes from 504 languages across the world, using as his database the authoritative online World Atlas of Language Structures, which includes phonemes based on differences in the sounds of vowels, consonants, and spoken tones. He then constructed a series of models, demonstrating first that smaller populations have lower phoneme diversity. 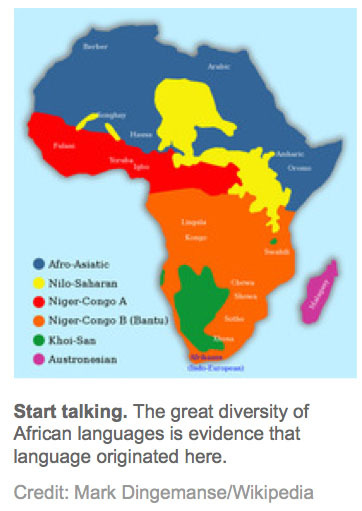 And, as also predicted if language arose in Africa, phoneme diversity was greatest in Africa and smallest in South America and Oceania (the islands of the Pacific Ocean), the points farthest from Africa, Atkinson reports online today in Science. The pattern matches that for human genetic diversity: As a general rule, the farther one gets from Africa—widely accepted as the ancestral home of our species—the smaller the differences between individuals within a particular population. Controlling for differences in population size and other potentially confounding factors, Atkinson then modeled the worldwide language phoneme pattern that would be expected if human language had spread from 2560 different potential points of origin around the planet. He found that the model that best fit present-day phoneme diversity patterns was one that put the origins of all languages in central and southern Africa. Atkinson's best-fit model parallels not only the overall genetic pattern, suggesting an out-of-Africa migration of modern humans, but also subsequent events in human prehistory. Thus outside of Africa, the greatest phoneme diversity was found in languages thought to have arisen in Southeast Asia, consistent with high genetic diversity there. This suggests that Southeast Asian populations grew very rapidly soon after our ancestors left Africa. And within the Americas, phoneme diversity was smaller the farther a population was from the Bering Strait, consistent with assumptions that the first Americans came over the strait from Asia and spread as far as South America. These parallels also suggest that human language predates the out-of-Africa migrations of 50,000 to 70,000 years ago. Atkinson concludes that language might have been the essential cultural and cognitive innovation that fueled human colonization of the globe. Robin Dunbar, a psychologist at the University of Oxford in the United Kingdom, says Atkinson's study is a "really novel approach" that overcomes the limitations of earlier studies. "The key to this was using phoneme diversity rather than words or grammar." And Dunbar agrees with Atkinson that language evolution might have been "crucial in facilitating" the African exodus. Bart de Boer, a linguist at the University of Amsterdam, adds that the paper "looks methodologically quite sound." But he says he is surprised that phonemes can be used to trace language evolution so far back in time—and that over the course of tens of thousands of years phoneme diversities in far-flung areas of the world have not "drifted back to the sizes found in Africa" because cultural evolution of phonemes is "much faster than genetic evolution." De Boer says that he would be happy if the paper turns out to be correct, but researchers must first be sure that its conclusions are not "caused by some methodological artifact we have all missed."